One park amid the impressive collection of National Parks and National Monuments in southern Utah shines above all others. This National Treasure is Zion National Park, where abundant beauty stops visitors in their tracks and leaving them gaping in awe. The crushing violence of Mother Nature has created perfection in the heart of Utah's Color Country, where years of raging storms have pit water and winter's ice and snow against rock, producing wondrous creations which are now protected by the National Park Service and kept pristine for all the world to enjoy. Zion National Park is an all season park and without a doubt, the crowning glory of Utah. Zion National Park in Utah is enchanting! "Spectacular" is uttered time and time again as eyes raise to view the statuesque monoliths of Utah's most visited National Park. Zion National Park unveils its eight layers of sandstone, displaying what has taken two-hundred-million years to carve and mold. This extraordinary corner of Utah is a masterpiece of towering cliffs, deep red canyons, mesas, buttes and massive monoliths. Zion's fame is due to more than it's lofty peaks. It can boast of its geology, hiking, backpacking and some of the best scenic drives anywhere. 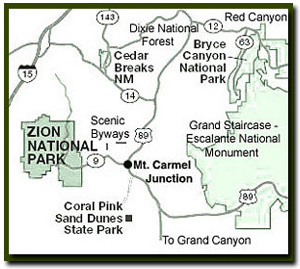 In the center of all this is Mount Carmel Junction, located at the east side of the park and only 60-miles from Bryce Canyon, 45-miles from Cedar Breaks, 9-miles from the Glendale entrance to the Grand Staircase-Escalante National Monument, 85-miles from Grand Canyon and 11-miles from the Coral Pink Sand Dunes. Canyoneer, Shaun Vernon, rappels above the Zion Narrows, the the most famous "hike" in the National Park System. Visitors should experience at least a portion of the grand daddy of all slot canyons - the Zion Narrows. The enchantment of nature is generous in Utah, where more than eighty-percent of the abundant state is land administered for public use by federal and state agencies. Zion National Park, Bryce Canyon National Park, Cedar Breaks National Monument and the Grand Staircase-Escalante National Monument share a common sanctuary in the vast desert of southern Utah. To their audience they reveal spellbinding allure, capturing the hearts of the world's visitors. Millions of people come to the Utah National Parks and Monuments each year, where they experience the medley of stone grandeur seen no where else on the planet. No where in America is the land so breathtaking, the air so clean and the water as pure as it is in this corner of the Southwest. Experience Zion National Park and some of the grandest scenery on earth in one short and spectacular vacation. Zion National Park Landmarks - Impressive Zion National Park landmarks literally fill Zion Canyon, such as Cathedral Mountain, Temple of Sinawava and the Great White Throne, each living up to its namesake. Zion National Park is indeed the showcase of the West. What are considered to be the "best Utah hikes" are located in Zion National Park as well. The top contenders include the East and West Rims, which are both hiking and backpacking trails, and of course the magnificent Angels Landing and gorgeous Emerald Pools. The Zion Narrows which is the granddaddy of the United States slot canyons, probably has no contender as the very best of all the incredible trails in the United States. The easy Weeping Rock Trail and Riverside Walk are short, scenic and also the most traveled hikes in the park. This guide will give you insight to Zion beyond the obvious. It will take hikers and windshield travelers alike into the depths of Zion Canyon, Kolob Canyon, Kolob Terrace and the main section of Zion National Park. Please take a moment and share us on Social Media. We appreciate it. If you enjoyed our free information, please link to us! Thank You!